Learn to harness the power of social media to increase your sales! This multi-session audio program is designed to prepare a sales professional to move to the next level of success in this evolving profession. Rapid technological changes in the workplace have created new demands for sales professionals. Now that the world is flat from a sales territory viewpoint, cross cultural negotiation abilities have created a need for a new skill set in the world of selling. 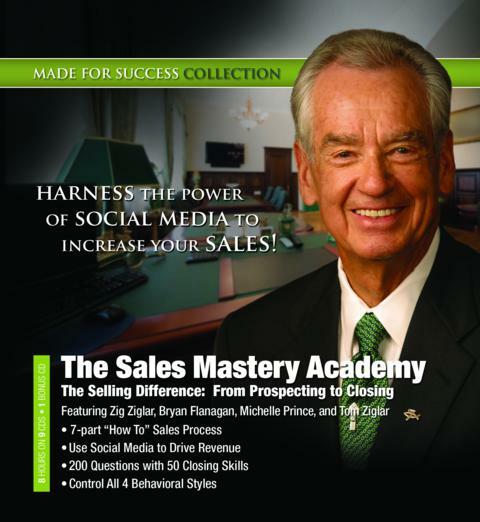 The Sales Mastery Academy has the answers, including sales prospecting skills, negotiation techniques, foolproof closing methods from the Master Closer, overcoming objections with the famous LQET formula, and of course, how to get and stay motivated. The concepts and skills outlined by three of the most sought after experts in their field will enable you to arrive with confidence and comfort. In this nine-part audio is a proven step-by-step process to guide you through the evolution of the sales profession. Learn how to set and achieve your goals with Zig Ziglar’s unique seven-step goal attainment procedure, and learn the fundamental skills to meeting the changes with prospects and customers. In many cases, the sales cycle is longer and there are more people and departments involved in decision making. Learn how to turn any product into a “solution.” Our customers, the economy, corporate profits, and social responsibilities are changing. How are you responding to these changes? Get equipped to compete and win more deals.